Here is preview of the pattern I am working on at the moment. Few more details to finish and if all goes well, as planned will share the pattern in few days. 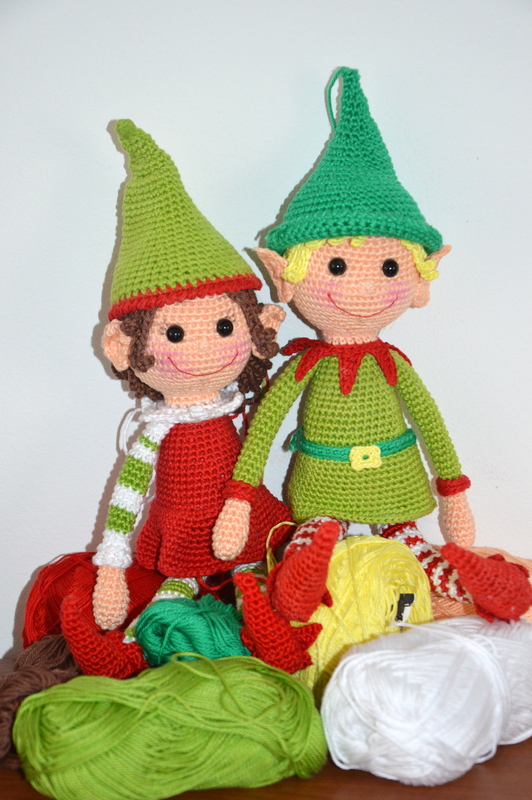 Finished size of these elves made in cotton DK and with 2 mm crochet hook is 24 cm (9.5 inches) -without hat. What is special and new in this pattern are two different hair styles you will learn. See you in few days with the patter and more photos to show. Wishing you all wonderful Friday! This week was inspired by my first doll I ever got (had). Was a plush, red, patch doll think is called in English, with rubber face. Was one of those you take for sleeping. Soft and cuddly. This week remembered that doll again, and said, why not making one. In my yarn stash had this ball of very old white cotton yarn. Even the way it looked you could say was very old. That was inspiring as well. “Vintage” looking doll, old yarn to go with..could not be better. Added few details at the end and came up with this little one. Little sleeping buddy doll in cow pijama. Topic of this post is sleeping buddies stuffed with rice/lavender. This doll is stuffed with rice and fiber fill stuffing. As I was stuffing the doll, was stuffing her in layers, mixing rice and fiber fill together. Only the head is stuffed with fiber stuffing all the way (but because had this head made some time ago). While working on the second doll, this idea of stuffing the doll with lavender crossed my mind. While having breaks, took a trip to wardrobe in search of the lavender bags hiding there. Picked up fw, took the lavender out and now had to make one more doll to try this out! 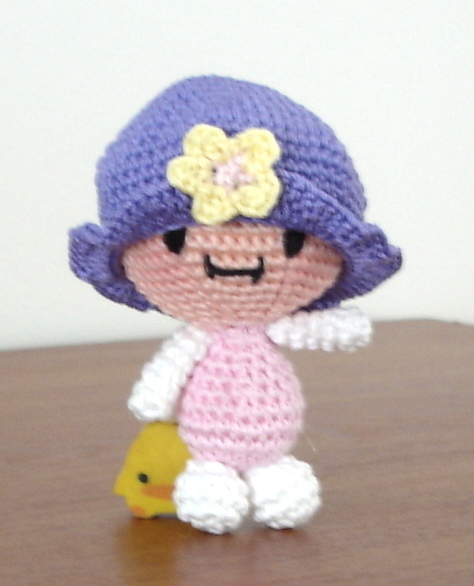 Lavender stuffed doll! That is why the third doll is all flowery looking 😀 She is lavender one! Stuffing it just with lavender doesn’t work. I was using last years lavender, and was pretty dry and light weight. You can’t really “stuff” the doll. Furthermore, lavender breaks and makes dust. To avoid this breaking of lavender and dusting, again used the layers stuffing method. Little bit of stuffing, little bit of lavender and at the end you get this beautifully nice smelling soft doll, what makes ideal sleeping buddy. Think we can start with the pattern. I am giving you the basic pattern, no details on the flowers or cow pijames. Even the colors I didn’t mention in the pattern, so you can work based on own wishes or yarn availabilities. Important is to keep the yarn weight same or very similar. R1: starting from the secong ch from hook, sc10, 3sc in one st (turn around), sc9, 2sc in one st. Tie off and leave long end for sewing the body with the head. Stuff the body well. Stuff the leg. Flatten the ends and single crochet through both sides (two stitches across), making 8 stitches in total. Cut the tread, log enough for sewing the leg to the body and pull out through the last stitch. Stuff the arm. Flatten the ends and single crochet through both sides (two stitches across), making 5 stitches in total. Cut the tread, log enough for sewing the arm to the body and pull out through the last stitch. Fold piece in the half, and stitch across side, through both stitches, making 25 st along the way. Cut the thread and tie off at the end. Ch60, and with needle pass and pull trough stitches on the bottom of hood (as shown on the photo). Cut off the access yarn, hide the ends, flip the hood inside out and is ready to be placed on dolls head. I like to fold out one row in the front of the hood. Find it nice looking on dolls head. Sew he body and the head together. Decide where the front/back will be so can start positioning and sewing the legs. Sew legs between the 4th and 5th row counting from the bottom (first, starting row). Leave one stitch between each leg. Place arms on the sides of the body. Sew them nicely through 5 stitches we have made while finishing the arms. Embroider the smiling mouth. Without mouth doll looks great as well. At the end place the hood on doll’s head and your sleeping buddy is done! 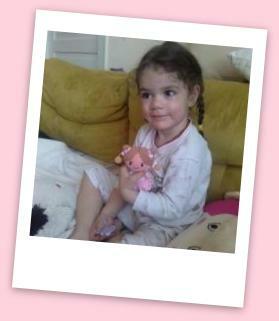 Hope you enjoyed reading this and will enjoy making the doll! Make as many as you wish for your family and friends. Let me know what you did for stuffing, how the work went and what was your experience with the pattern. If you will encounter any mistakes done, let me know, and will correct them immediately. Thank you all for your time spent reading my post! I have forgotten to mention few details. The work is done in continuous round (at least it is how I did it, you do it the way you like and prefer). After each row is finished, continue without slip stitching or chain one. Mark the beginning of each row for easier counting and pattern following. Since I started this blog, just few months ago, encountered so many great bloggers that I would like to thank for all their effort and work done blogging. For their kindness to share with us their thoughts on some ordinary and non so ordinary issues, to share their knowledge trying to teach us new things, or just for being here so kind and so nice as they are and make this blogging space be a nice, warm and happy place for all of us that follow them. One among these great bloggers I encountered is Tales Of Twisted Fibers one. Name suits her perfectly! If you haven’t been there yet, I warmly recommend you to go and check her out. Check and see why “twisted” and why we love her so much. Here is the link of her Bee Girl! Check her out before you proceed! Making the doll was so much fun. Pattern is easy to follow. Outcome, the finished doll looks great! I love it and am sure all of you will! Here is my Bee Girl made out of pattern designed and published by Tales Of Twisted Fibers. Thank you ToTF for this wonderful pattern and your kindness and generosity to share it with us! Few weeks ago I have introduced you my Ella the elephant , and promised how soon will write the pattern (readable one 😉 as well. Meantime got several mails, asking me if this pattern is available. So to all who asked, yes, and here it is. While working on the pattern made the second elephant. Made few changes on the boy one. His legs and arms are slightly longer than Ella’s. In this pattern I have wrote down both options. 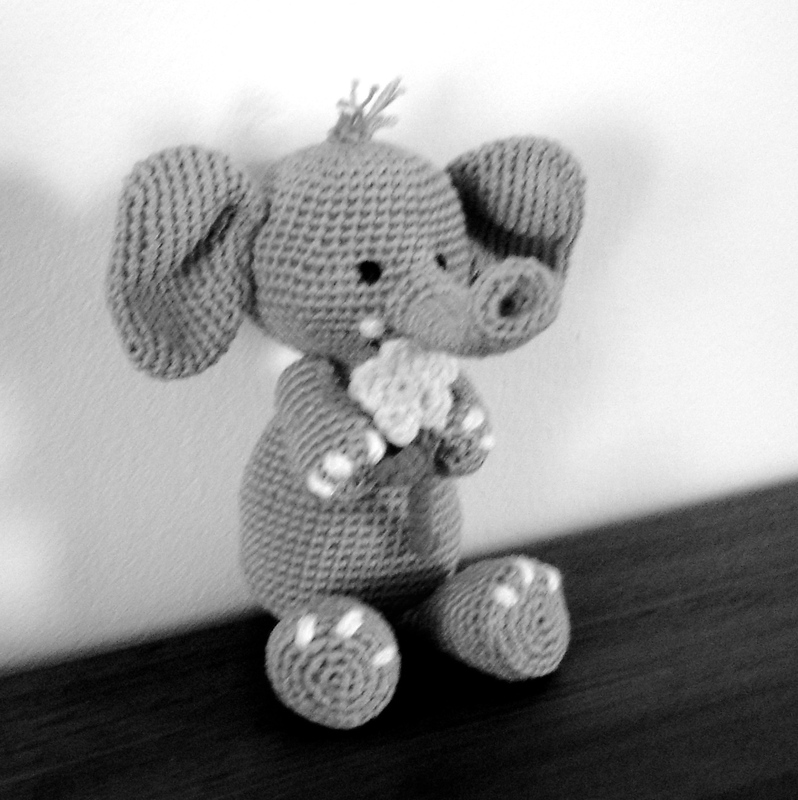 For making a boy (in my case it is grey elephant) all you will have to do is add few more rows on arms and legs as indicated in the pattern. You will see, it is all written and easy to follow. You will work in continuous rounds. Make sure to mark the first stitch, but only for the easier row count. You will not be working any slip stitches at the end of each row, or any ch1. As you finish, just continue working the next round as indicated in the pattern. When finishing the piece, after making last single crochet, slip stitch to the following stitch and tie off pulling the thread out of the stitch. 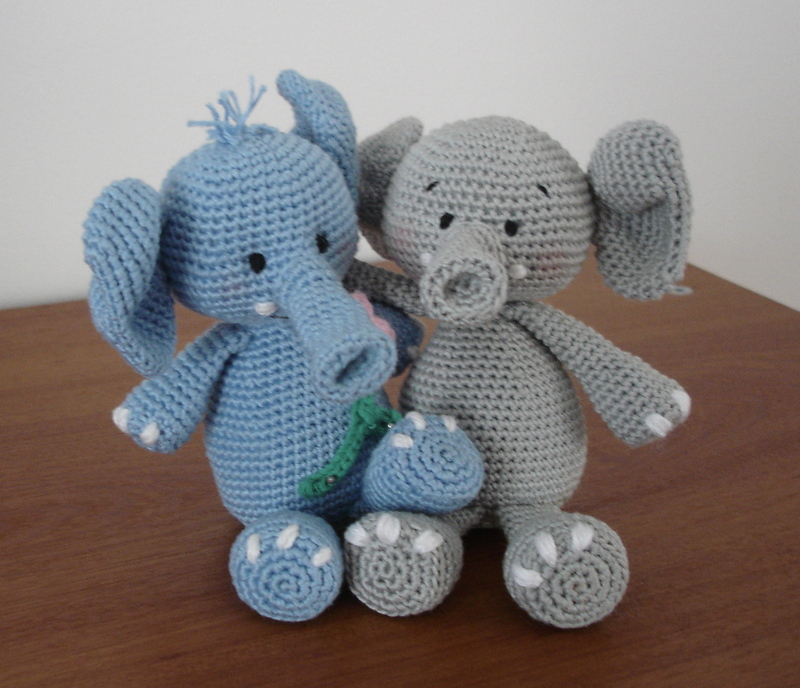 Here is the Ella the elephant pattern. If you work with safety eyes, place them here leaving 6 stitches space between each one. Tie off, stuff the head firmly. Tie off and leave long end for swing the ears on the head later. Tie off and leave long end for sewing the nose on the head later. Tie off and leave long end to sew the body with the head later. Stuff the body well. Tie off and leave long end for sewing the legs later. Stuff only the wide, bottom part of the legs with the stuffing. For grey elephant kind of arms, add 4 more rows. Tie off and leave long end for sewing the arms later. Stuff only the wide lower part of the arms with the stuffing. Tie off. Make a simple knot at the end. You can add few more threads in the last loop before fastening to give end of the tail have few hairs (and sew all as kind of little tassel), but it is optional. Sew body and head first. You will have 18 stitches to connect at both sides, so it should be pretty easy and give you nice clean connection. Start sewing, connecting end stitch of the head (where you tied off ) with end stitch of the body (where your thread for sewing begins), facing each other. Before finishing the sewing, add some more stuffing to the head and/or body so they connect nice and fill all empty spaces there might be between head and the body. Now before sewing the rest look at your elephant carefully. Turn her around looking at the head, until you notice the points where you started to make decreases. Pick one you like the best, as this peak will be the one onto which we will sew on the nose. Safe place the nose, with bobbin pins and sew it on the head. Sew through both loops of each stitch, for every stitch around nose. It is little picky work, but be patient so it will look nice later. Arms you will sew on sides of the body. Take nose as the center point. Leave 5 stitches between each arm (looking from front side). Position the arms, safe them with pins and sew them nicely. Turn the Ella upside down. Count 7 rows from the middle towards the front of the belly. You will be sewing the legs between row 7 and 8. Take the bottom ring as your center point to position the legs evenly. Leave 3 stitches between legs, safety pin the legs on the body and sew them nicely. Ears: Position the ears evenly on the sides of the head. Place the ears starting R8 downwards, till R13. Sew them nicely, tie off, hide the ends. Sew the tail between row 7 and 8 (counting from the starting ring of the body) centering it at the back side of the body. Now you Ella is sewed completely. Sew on the eyes one row above the nose level, leaving 6 stitches between each eye. Sew them through only one stitch. If you would like to use safety, eyes. Place them right after R13, leaving 6 stitches space between them. Using white yarn or embroidery thread, sew the tusks on the sides of the bottom of the trunk. Go through one stitch several times to create ball kind shape to indicate small growing tusks here. Two rows below the trunk, using black yarn or embroidery thread, embroider the mouth, stitching through three vertical stitches. Then curve them with diagonal stitch both sides, to make it smiley effect. Using white yarn or embroidery thread, sew the toeanails same way as you did with the tusks, leaving 2 stitches space between each. Start the stitch at the bottom of the leg or arm and sew over the edge ending in the first stitch above (the edge). Tie off at the end and hide thread inside the arm or leg. At the end if you wish to make hair or two at the top of Ellas head. Cut two or three strings of yarn, 5-6 cm long. Using crochet hook (try some smaller size so you don’t make big gap on the stitch) pull it through one stitch at top of the head, hook the yarn folded at half, pull out through the stitch. Pull just enough to create a small loop you will use to yarn over and pull the rest of the strings through. Make two or three hars like that, cut them to the length you find likable. And your Ella the elephant or her boy friend are done. 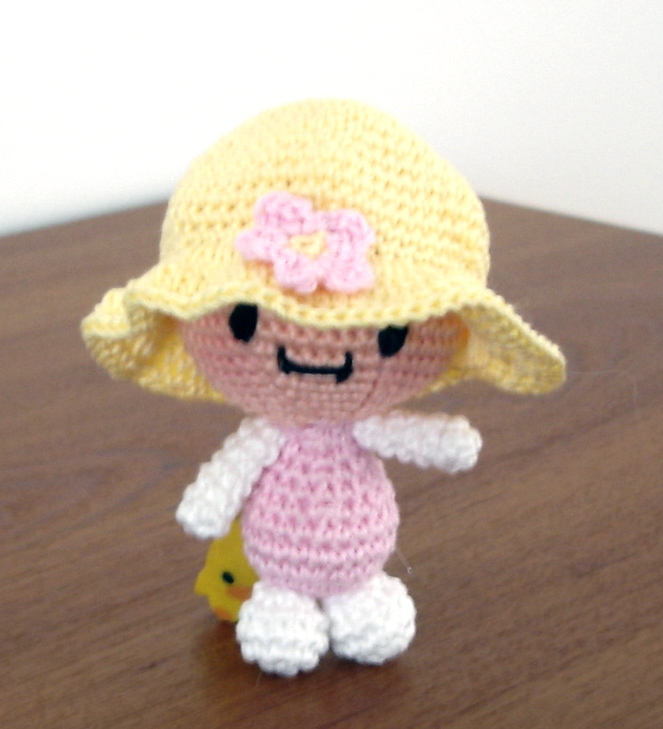 Thank you for trying this pattern out, and make sure you show us your finished dolls. Pass these pattern to your friends. Make Ellas or her boyfriend for people you love, but please do not sell them or try to make profit out of them. Allow me, as their designer, to enjoy the joy giving them for free and available for public use. At the end it is not the money that make people happy, but us being kind and respectful to each other. If you will encounter any problems during your Ella amigurumi work, with the pattern or work itself, let me know, feel free to contact me. Will be glad to help you. 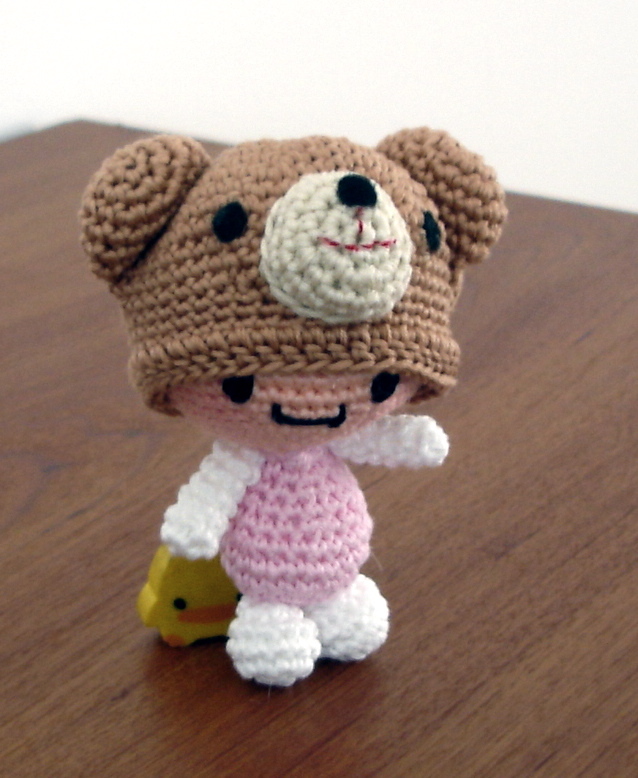 This week wanted to talk about amigurumi doll’s hair making. If you ask me, it is the hardest part of finishing the doll and making her look the way we imagine. At least it is for me. Tried so many different versions of hairs to be done on the doll, and hardly ever was satisfied with the final outcome. Those tapestry way, with wool and pulling out hair by hair; works fine I guess. Eats a lot of wool, but what you can do with it is either freaking out looking doll or to make it look “decent” is pony-tail(s) or braids. Then there is a wig making. Sorry to say, but for that am complete idiot. Tried it several times, but each and every doll looked so sad with this helmet looking wig on. 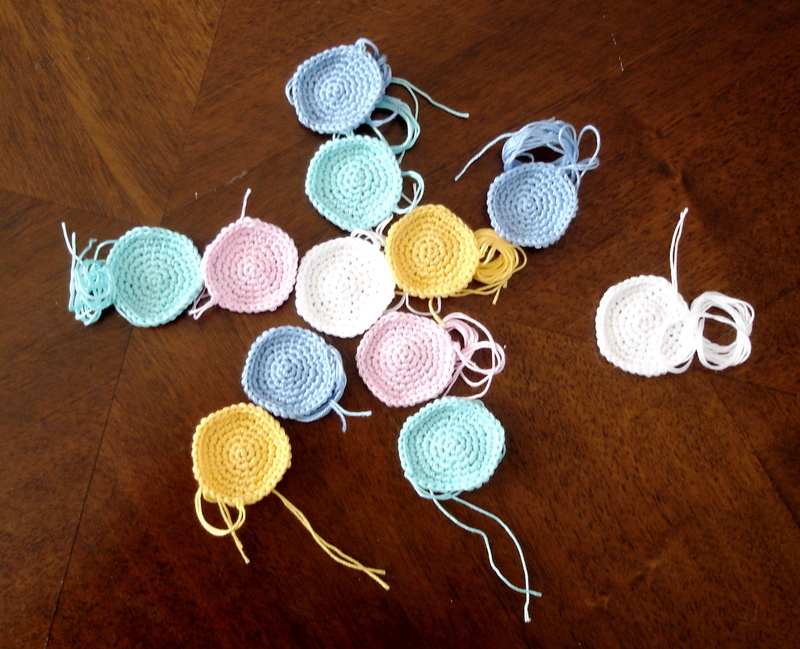 Crocheting “discs” as I call them (small round pieces) and placing one or two on top of the head, as you can see at some of my doll photos in the gallery, worked fine. Liked the results. Making tassels to go with them or braids, and placing them on sides or top of the head….. yes, many possibilities and are easy to make, and at the end doll looks nice. Cute and “dolly”. I wanted more out of hair! That kept me busy thinking and trying. 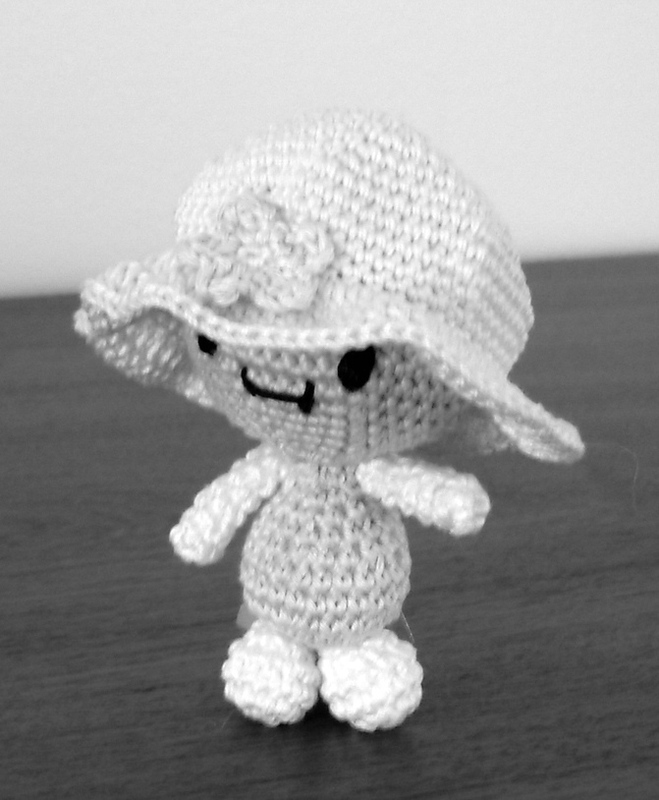 I am sure I didn’t invent anything new; specially to those that are in amigurumi world for quite some time, but it is new to me. 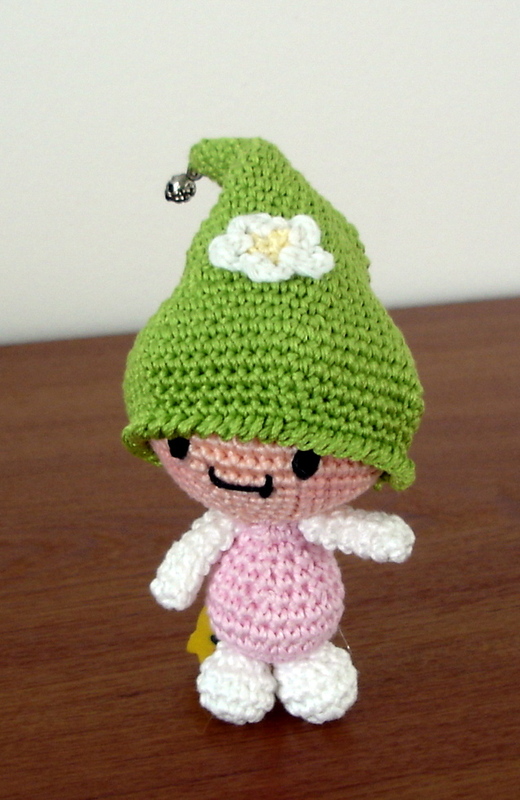 The pattern for entire doll I tried to make simplest possible. For some problem might be making legs and body in one peace, but if so, just make two legs and body separated, counting the stitches used in the pattern. For any questions you might have, I am here, and will be glad to help you. If you are using safety eyes, place them between row 10 and 11, leaving 6 stitches between them. Fasten off and stuff head firmly. Stuff little by little and form so you shape the head nicely. Ch1 and begin single crochet stitching to the side, toward the top of the head, where magic ring and first row is started. Reaching the magic ring we will start making bangs. Slip stitch 1 in the magic ring, chain 10, and return back slip stitching 9 at each stitch on the chain. Slip stitch again to the magic ring, ch 10, return back slip stitching to 9 stitches on the chain, slip stitch to the magic ring, and repeat 3 more times, or until you create desired number of the bangs. (in my case there are 5). Finishing last peace of hair, single crochet to the working side of the hair, and continue sc into each last row stitch (14 sts). Reaching the end, tie off and leave long end for sewing the hair on the head. Here are few samples of what you can do. Some you could see at presentations photo on the start of this post. Would have been to much if I tried to write down each and every pattern for different hair styles I’ve done; but as I said, if you will need any help, feel free to contact me and ask. Will be glad to help you. Hair we are making in this pattern is the one shown on the first photo published here; look at the last doll in the line. One with light brown hair (yellow and blue dress). Stuff the bottom of the leg. Change color of the thread and continue with R7. Tie off and leave long end for sewing later. Stuff the leg. At this point stuff the leg and bring both legs together. Pull out the yarn from the first leg you left for sewing later, through the gap between the legs. So it doesn’t come to your way while crocheting. You will use this yarn to sew this gap after body is done and stuffed. Tie off leaving long end for sewing the body to the head. Stuff the body as firm as you can. Now take the sewing needle and the yarn there is between the legs (one you left from finishing the first leg) and sew the gap nicely. Tie of and leave long end for sewing the arms to the body. Tie off and hide ends. Put the dress over the body and sew the body on the head. Sew on the hair, and finally place and sew the arms (I find it best if you leave 6 stitches looking in front of the dress, between each arm). I also suggest to sew the arms on the dress only. Not only it is easier, but gives you space to sew and hide ends nicely. And you own BB Doll is done. I hope you have enjoyed making it, and the hair you have learned will open up a whole new possibilities. Experiment and try different styles. Share what you have learned and teach us something new as well. Since I started with this blog, I do try to write down all I do. Even first time doing it. Now need time writing it all nice and readable 😀 Let us get back to what we have started here; hats for little Karla doll. You all met Karla. Since last time you saw her, her hair grew a little, but still not enough to take the hat off 😀 Will show you, her recent photos, but please, if you will must laugh, turn your head around and laugh quietly. We really did our best to comb and make nice hair style for photo shooting today. 🙂 we said no laughing loud!!!! Today, tried to make up few hats together with patterns, so all of you that asked for something different to put on Karla’s head, now have few options to choose from. Here are hats I have made today. These are really basic models and very, very simple to make. You can use them to make so many different styles. 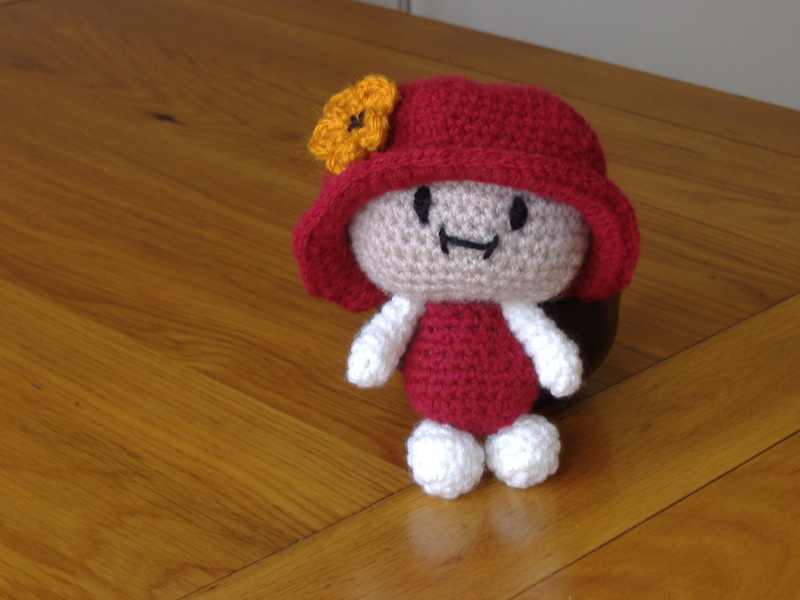 Once you’ll start and let your imagination lead you, you will see how it becomes never-ending story (when it comes to creating something new 🙂 So do not hesitate, take your little Karla, some yarn and needle and start creating new hats for this little one! Let’s continue with the hat patterns! Starting with little mint green hat. fasten of and leave long end for sewing the nose to the hat. Fasten off and leave long end for sewing ears to the hat. Sew nose and ears to the hat. Glue some black cloth pieces on the top of the nose and in place of eyes (or sew them on with black thread). This way you can make polar bear, duck, panda, koala, frog….so many different animal hats. fasten off, leave long end for sewing the flower to the head. If you have any idea of new hat pattern you would like to see, or have a pattern you would like to share with us, let me know! Send me e-mail, or post a comment! Finally finished! 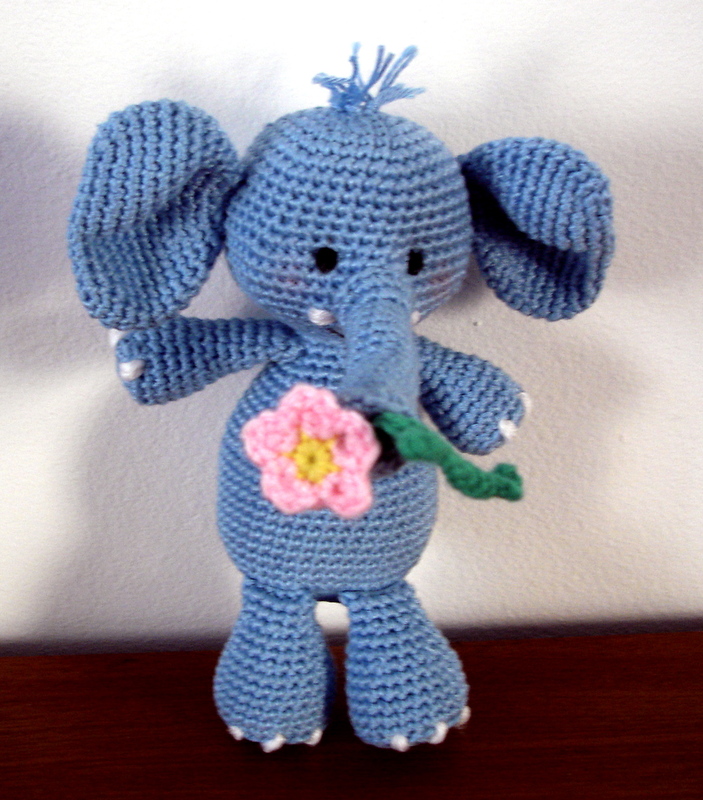 Let me present my first elephant amigurumi, little Ella. As I always make several of same dolls to check up on the pattern, right after finishing her made her a boyfriend as well. Think both make nice infant or baby toy. Both are soft and cuddly. Further more, had some left over yarn, so used it to make little fun ball. Suggest everyone to do it. makes great baby gift or cat toy. 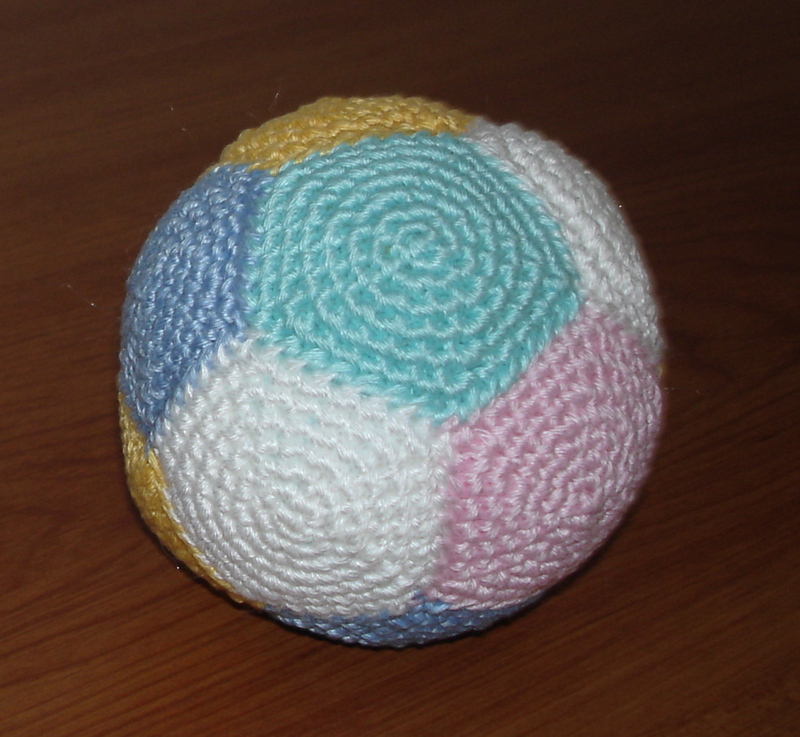 All you need to do is to make 12 equal size crocheted discs and sew them piece by pice together to create this ball. Before sewing the last one, stuff it in finish sewing up and ball is ready to play with. Here are few pictures. Doing my best to systemize and write down as many of the patterns I have worked on and to publish them here. Wish days are longer in order to finish them sooner. Today published Totoro squad. Fore many, one of the fave ami dolls. 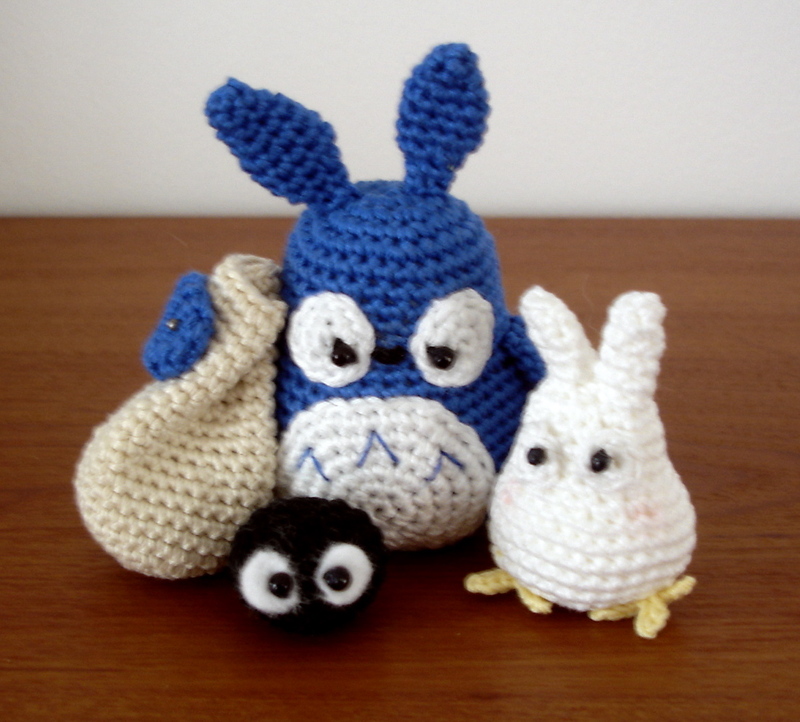 This is my version of Totoros. 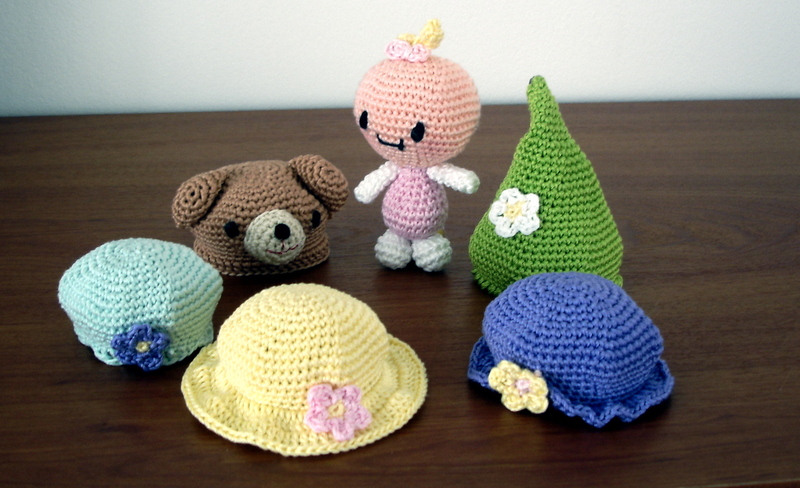 Chu, Chibi and Sprite pattern are available under free patterns from today. Hopefully soon will finish and place more patterns. 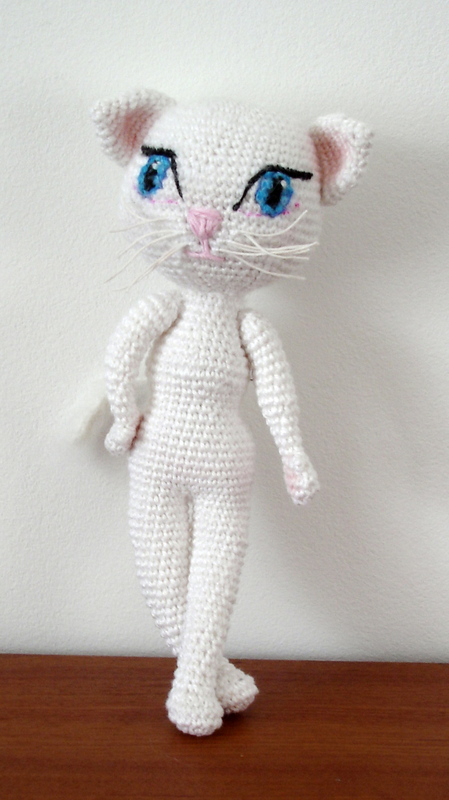 First heard of Angela the cat when my friend told me how it is adored by her daughter Sara, and asked me to make that cat as amigurumi doll for her. For all of you that don’t know who is that Angela, here is a picture of this adorably cute cat. 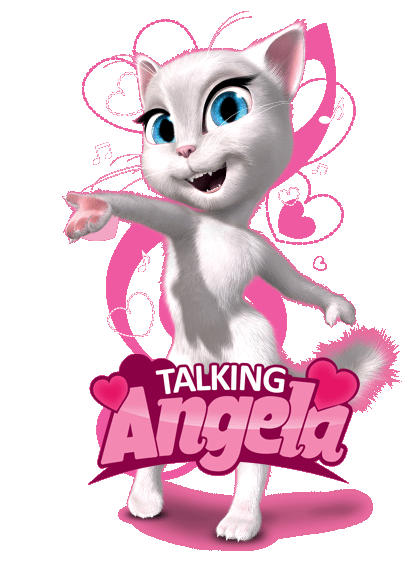 Took me a few days, maybe more…almost a month to research about this Angela cat and to figure out how to do that doll. Encouraged myself this week to finally make it, and here it is what I came up with. My version of Angela the cat. Even have the pattern done and ready if you would like to try making one. Have to say, that it is working pattern so some mistakes might be found. I did check it in written, but didn’t make time to make second and third Angela cat to be absolutely sure about this pattern. So keep that in mind if you decide making Angela. So here is the pattern! Hope you will enjoy making Angela! Tie off and stuff the head firmly. Tie off and leave long end for sewing the ears later. At this point start stuffing the leg and continue as we move along. Tie off, finish stuffing the leg and leave long end for sewing later. After finishing Row 26 DON’T cut off the yarn. Now take both legs together and put them side by side, toes pointing same direction. Tie both legs together for easier work to continue. Pull out the yarn you left for sewing on the first leg made through the gap between the legs so it doesn’t get into your way while crocheting. We will use it later to sew and close this gap. Tie off and leave long end for sewing body to the head. Stuff the body well. Outline the iris of the eye with two threads of blue embroidery yarn. On upper black stitch embroider tiny white spark. Outline the upper side of the eye with black embroidery thread to give it long lash kind effect. To fill gaps on eyes or eye lashes, you can always use some markers to make tiny corrections. From the lowest nose point, sew the mouth line pointing down, additional two stitches, and from there sew two stitches long line to each side to create mouth shape. As I like working with 100% cotton yarn, so is one made of such. 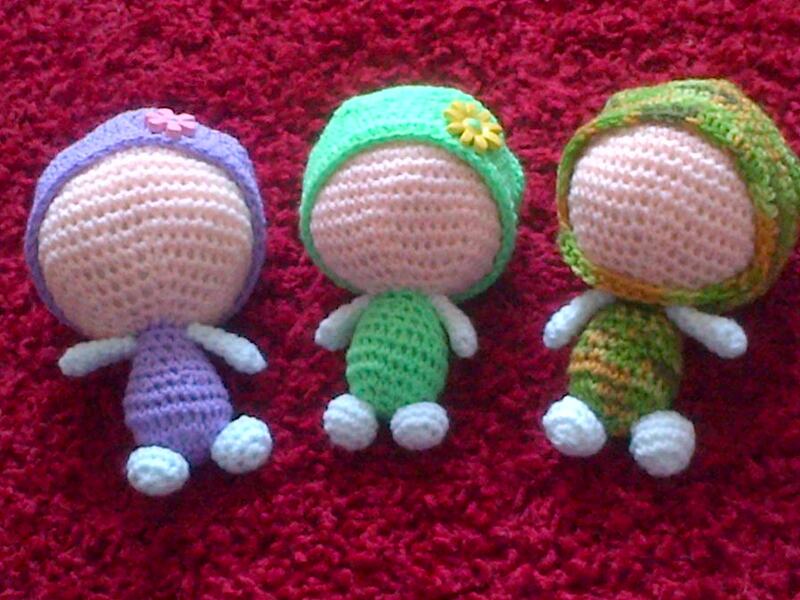 I like my dolls to be easy to maintain, and also like them to be suitable for smaller children (more hygienic and hypoallergenic). That is why I choose cotton. 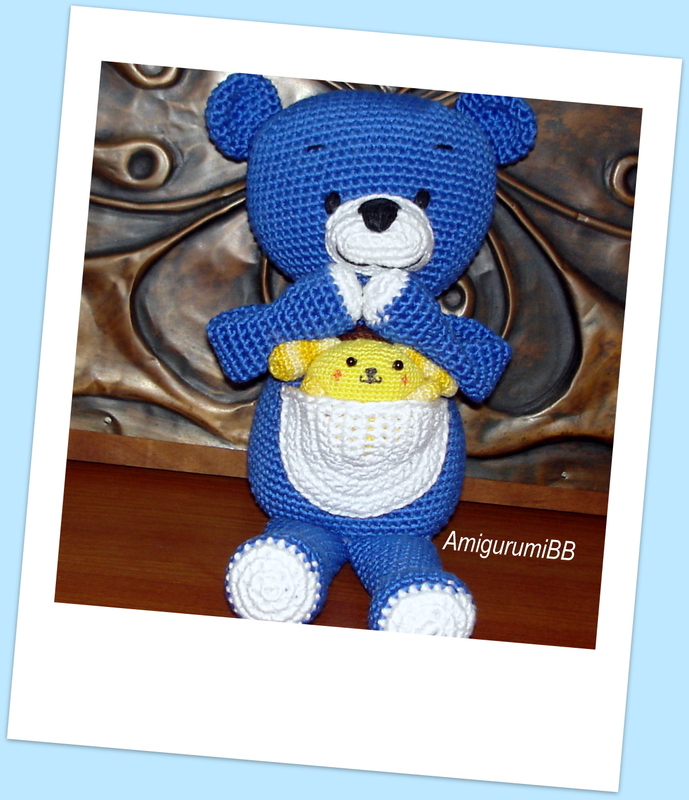 This teddy is made of 8ply (sport weight) cotton yarn, crocheted with 2 mm size crochet hook. Head and body are stuffed firmly, but arms and legs are stuffed just in the bottom parts of each. Didn’t use pebbles (didn’t have any) but think those would make nice change weighting limbs downwards. Will have to give it a try with next one, while checking the pattern before publishing it. 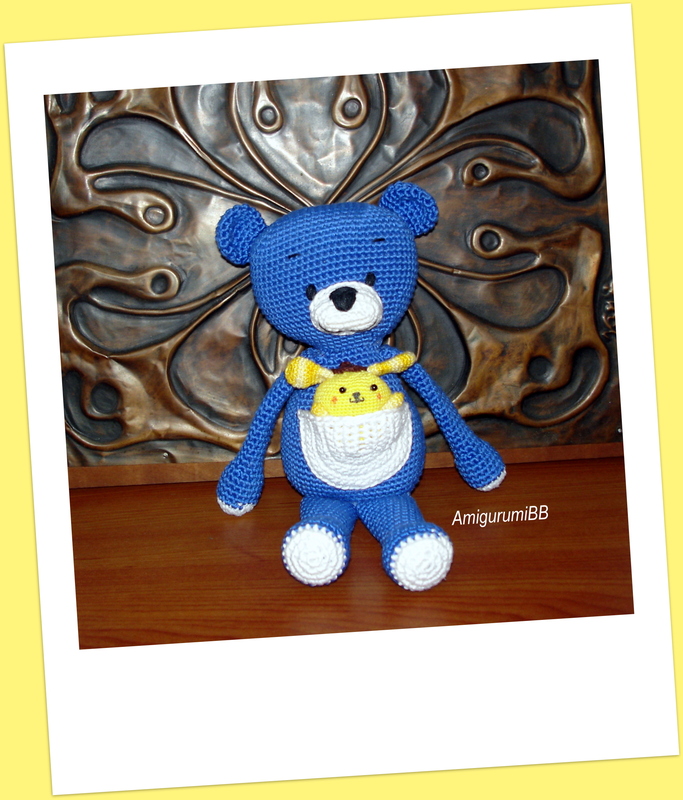 In the front, on bear’s belly crocheted this simple half oval pocket. And that’s it! 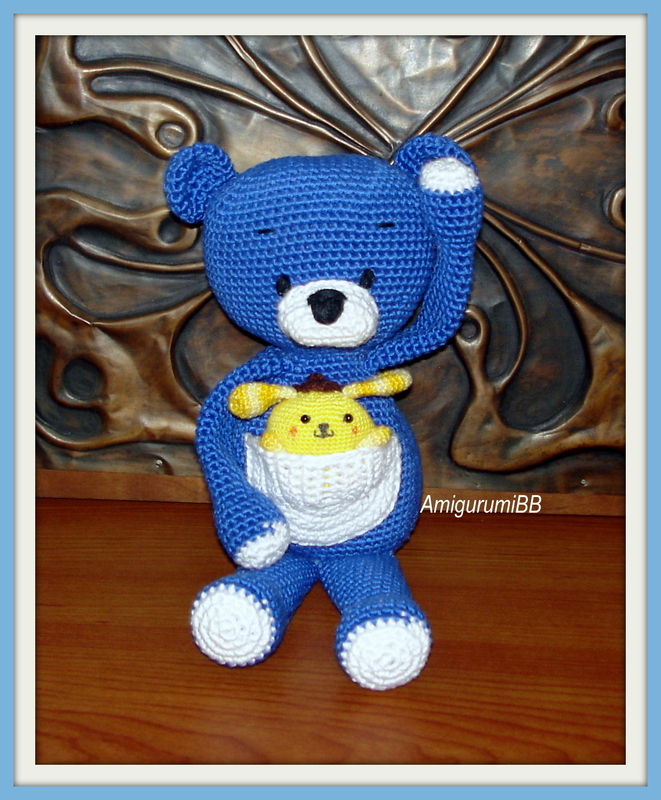 My Blue Bear done and ready to play with. Hope you like him. At the moment working on elephant soft doll and Angela the Cat. In few days will come up with new photos.